Foam Concrete / Cellular Concrete is a mixture of bonding material, water, admixtures and technical foam. In its essence, it has been known for more than thirty years. It is a building material with good mechanical strength, low thermal conductivity, simple, yet highly technological processing. Cellular concrete (CLC) contains encased air voids, thus achieves its low specific density and input material saving. Variability of properties and a wet process in production offer wide application of the foam concrete for levelling layers, filling different “dead” spaces and for producing prefabricated panels and blocks. In practice, the most common application find PBG 35, PBG 40, PBG 45, PBG 50 foam concrete types with a density ranging from 350 to 600 kg/m³ and the compression strength up to 1.5 MPa after 28 days. SIRCONTEC CLC types PBG 35-50 enable bound and stable levelling of uneven surfaces and processing like with self-levelling screeds. The large majority of the produced foam concrete is used for making levelling layers of floors, where it replaces board material. We recommend that PBG produced and delivered by practically verified SIRCONTEC machines, is applied in thickness from 30 to 400 mm in one layer. When using PBG as a floor levelling layer it is recommended to prevent absorption of the batch water into the base by using a SIRCONTEC penetration agent and into the walls by means of a non-absorbent flexible perimeter strip or a PE foil. Contraction cracks may appear in PBG layer after having set, which is not a defect. SIRCONTEC Co., in development of the equipment and determining production and testing procedures, emphasizes permanent quality of the manufactured foam concrete. The Quality Assurance system and the quality steadiness comply with conditions of ISO 9001 system. SIRCONTEC cellular concrete is suitable for application within the temperature range of the atmosphere and the base from +5 to 30 °C. At the temperature above 25 °C, it is recommended to moisten the surface or treat it with one of SIRCONTEC chemical agents. Foam concrete produced and delivered using SIRCONTEC machines can be pumped up to a height of 80 m; above this limit we recommend a consultation. The PBG 35 belongs to the most often used types of cellular concrete which is mainly for its acceptable price. SIRCONTEC recommends to use it especially for making levelling layers of floors in the period when the temperature of the surroundings and the base reach above +15°C, i.e. it is used mainly in summer when the temperature above 20 °C contributes to shortening the time of achieving the walkable strength. As compared with PBG 40 modification, it has slower start-up of setting and therefore the application of the subsequent layers is possible only 72 hours after it has been poured. The PBG 40 belongs to often used types of CLC which is mainly for its acceptable price. SIRCONTEC recommends using it especially for making levelling layers of floors in the period when the temperature of the surroundings and the base reach above +12°C. As compared with PBG 45 modification, it has slower start-up of setting and therefore the application of the subsequent layers is possible usually only 56 hours after it has been poured. The PBG 45 is often used type of foam concrete which is mainly for its favourable ratio price/effectiveness. As compared with PBG 40 modification, it has significantly faster start-up of setting and thus earlier application of the subsequent layers. The walkable strength is achieved as soon as after 40 hours at 20 °C. SIRCONTEC recommends using it especially for making levelling layers of floors in the period when the temperature of the surroundings and the base reach above +8 °C. The PBG 50 is the least used SIRCONTEC cellular concrete type. It is mostly used when maximum shortening of the strength achieving time is desirable. The walkable strength is attained as soon as after 24 hours at 20 °C. SIRCONTEC recommends using it especially for making levelling layers of floors in the period when the temperature of the surroundings and the base reach above +5 °C. Values of compression strength and periods necessary to acquire walkable strength are achieved at the temperature of the base and the atmosphere 20°C. A lower temperature may cause an extension of the period and a slower acquirement of the final strength. The Technical Data apply to PBG produced from CEM II 32,5R class cement. Illustration photo of making complete floor layer composition can be seen in Photo Gallery. Information concerning the foam concrete production and delivery equipment can be found here. 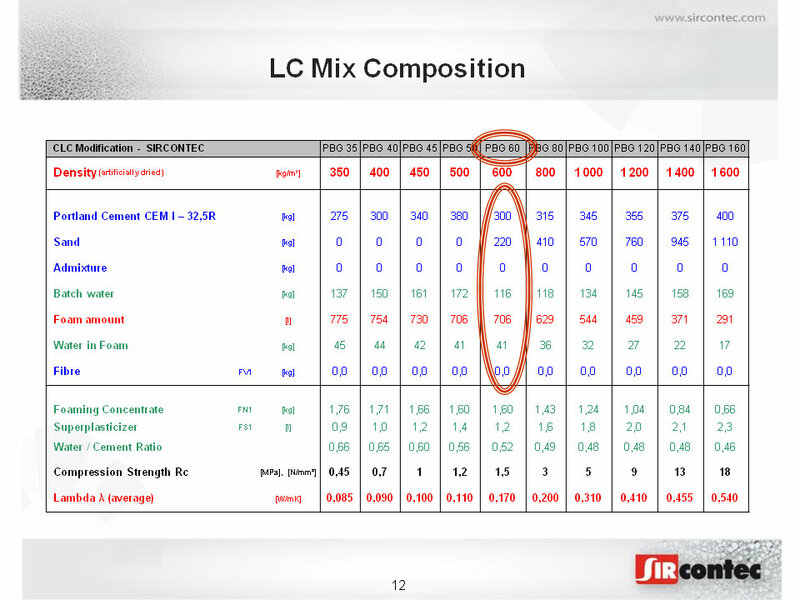 General information on lightweight concrete types find in the section Lightweight Concrete. Specific technical info on PBG 35-50 find below or in the Download section.